Why can’t this get fixed? I’m asked. What is the delegation doing about it? I’m asked. For that, you may need some background. Sadly, when the 17 members of the Richland County Delegation only meet ONCE a year (usually December), not much can get done. And when you only have three Republicans and 14 Democrats, getting a fix requires bipartisan help. Since November 2012, very few Democrats have seemed eager to help; but I do want to say there are some Democrats who, like me, feel there’s too much resistance from other colleagues on the delegation to make changes we all know are needed. Today I noticed these two editorials in The State. I agree with those editorials and many of you that tell me that “we” need to replace the board; but how? If “we” can’t get enough votes in the delegation to remove/replace current board members, we’ll have to hope the board members will do it for us. Many have asked me how are the board members are chosen? That has been a sticking point with me for ten years as Richland handles the appointments process much differently than Lexington County. Three and a half years ago, I briefly discussed the Appointment process to Richland County Boards and Commissions. I plan to share more later; but what everyone should know is this: those members of the Appointments Committee screen the applicants and only the applicant(s) the Appointments Committee decides are “best” are sent to the delegation to vote yea or nay. I can’t recall one time in my ten years that the Appointments Committee recommendation didn’t get enough votes from the delegation. HOW CAN YOU HELP? If you are interested in serving on the commission, click above on the notice and print the application and send it in – before the deadline. It’s not an easy process…and the job obviously won’t be an easy one…but if you’re qualified and your desire is to effectively run a board so that your county won’t be mired in this mess much longer, please apply. We all know the problems. What is being done to fix them? A year and a half ago, I outlined what I believed were four necessary steps to avoid another fiasco. None of this could be done on my own; but I do wish to thank those like-minded delegation members who supported some or all of these steps. From The State 12/3/2012 “He (Ballentine) is the first member of the county’s delegation to publicly call for her (Lillian McBride’s) dismissal. Others joined and, although it took a while, and the board actually moved the former Director instead of dismissing, change at the top occurred. Of course, after another director was hired – and since fired – the question now resurfaces, is this board even constitutional? More on that later. 2) Legislation to hold the board/commission more accountable . Representative Finlay and I joined a colleague from Horry County in hopes we could provide more (any) accountability to this commission. H.3197 ultimately died in a House Committee when colleagues narrowly defeated the bill because of concerns over putting the commissions under the Secretary of State. Recently, I supported H.3198 along with colleagues James Smith, Mia McLeod and Beth Bernstein. This bill is on the House floor for debate and, instead of putting accountability for the board/commission with the Secretary of State, would put it with the State Election Commission. We’ll see if this bill can pass the House this coming week before we begin the floor debate on the budget the following week. To help our community, I followed through on this plan by filing H 3724 early in the session (February 28, 2013). The bill passed the House less than 2 weeks later on March 8, 2013. The bill sat in the Senate until ultimately the entire delegation passed a county-wide bill reducing precinct sizes months later. That bill incorporated the changes I submitted previously for House District 71. NOTE: Assuming the Voter Registration & Elections office can deliver, notices will soon go out informing voters of their polling location (some will be new, some will stay where they voted last time). Regardless, precincts in our community will have fewer voters than previously. I will be sure to keep our voters updated on this through my website, regular Community Updates, Facebook and Twitter. Everyone will know where they will be voting for the next election! Debate still continues but we did revisit “early voting”. Nothing final has passed yet; but I did revisit this debate and was able to support measures I had not previously endorsed prior to the fiasco we had here in Richland County. Obviously, steps 1 and 2 above are still needed and I ask that you contact your Representative and Senator if you agree as well. As we’ve all heard often (and Representative Finlay shared in an interview last week): the definition of insanity is doing the same thing over and over and expecting different results. If you want different results, please contact your Representative and Senator and express your concerns. Somehow, many delegation members continue they don’t hear from their voters about this. For more background, below are related posts that have appeared on this website since Election Day 2012. November 16, 2012 What questions do you have regarding the Richland County election mess? 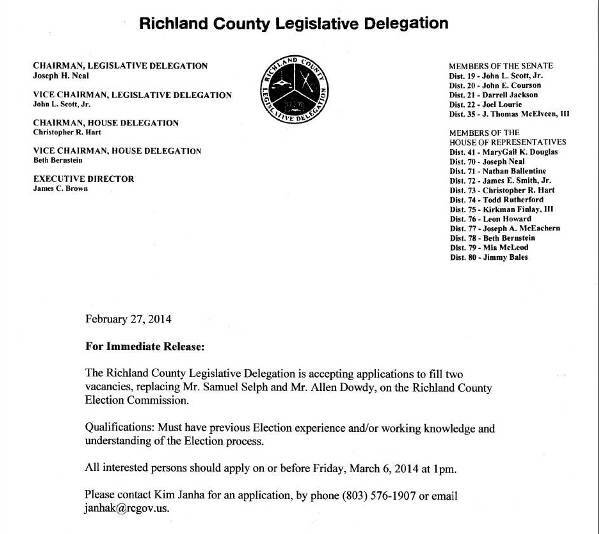 November 24, 2012 Richland County Election Analysis: Duncan Bell NOTE: When given the chance, the delegation did not vote to appoint Mr. Buell to the commission. If you’re a Richland County voter, who waited in lines for several hours last November, or a taxpayer, who is now having to foot the $100,000 tab for this mess, you might want to read the final report. RICHLAND COUNTY, SC — Richland County Council finally agreed Tuesday to pay more than $100,000 in bills for the lawyers who cleaned up the county’s November election mess.But not until after some unusual procedural moves, a change of heart by two members and the chairman’s threat to enforce a time limit for Councilman Bill Malinowski as he questioned charges for travel and telephone conversations. The council, which had put off the decision twice before, agreed to pay $72,423.10 for lawyer Steve Hamm to investigate Election Day problems and recommend how to fix them; $9,348.75 for lawyer John Nichols, who represented demoted elections director Lillian McBride; and $17,924.20 for Helen McFadden, who kept the election results from being overturned in court. Today I had another conversation with Mrs. Nicholson in the SC State Housing Office and I learned that tomorrow (Tuesday, May 21) the “2013 Point Scores” of all applicants this year for tax credits will be posted. I have been told many of the proposals in the competition have a perfect score, this year a 186, and the Authority will utilize the tie breaker criteria outlined on page 11 of the 2013 QAP in order to break the ties. The Authority is still in the process of underwriting the developments and plans to make final award announcements in mid-late June. As I previously shared weeks ago , there are 65 applicants across the state; but only 16 or 17 will be funded. Today I learned that of those 65, aprpoximately 20 to 23 are in the “GP” category and in that “GP”category, only 4 or 5 will be funded. While nothing is certain, based on the community’s opposition – and based on no letters of support from local officials, I feel that the Bickley Manor project will not be one of the 4 or 5 from the group that is funded. Again, just my feeling here, should the project not get tax credit funding, I do not believe the developer will have an interest in continuing with the project. I want to thank each of you who has written, called, and emailed my office. More importantly, you contacted the SC State Housing Authority to voice your concern as well. It’s my hope and belief that in mid-June, we will see that this project will not be awarded tax-credits and therefore will not proceed. As always, come back to NathansNews.com often and stay informed and share your opinions, advice, concerns. With the recent incidents around Chapin and Irmo , I wanted to be sure everyone knew our Richland County Community Action Team contact! Deputy Mo Gabr can be reached at 513-9622. As you can see in the picture above, he covers from Piney Grove out to Chapin and had visited several Chapin communities recently. If you’d like him to visit your neighborhood HOA, please give him a call. If you are going to be away and would like your house watched, give him a call. 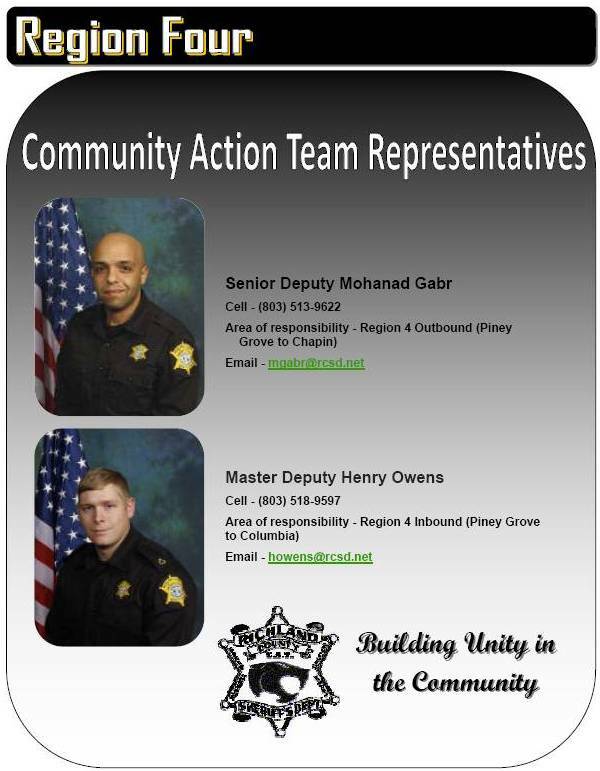 To learn more about the Richland County Community Action Team, click here . Obviously, please call 911 anytime there is an emergency. Recently, I got to appear on OnPoint! with Cynthia Hardy on WACH Fox. 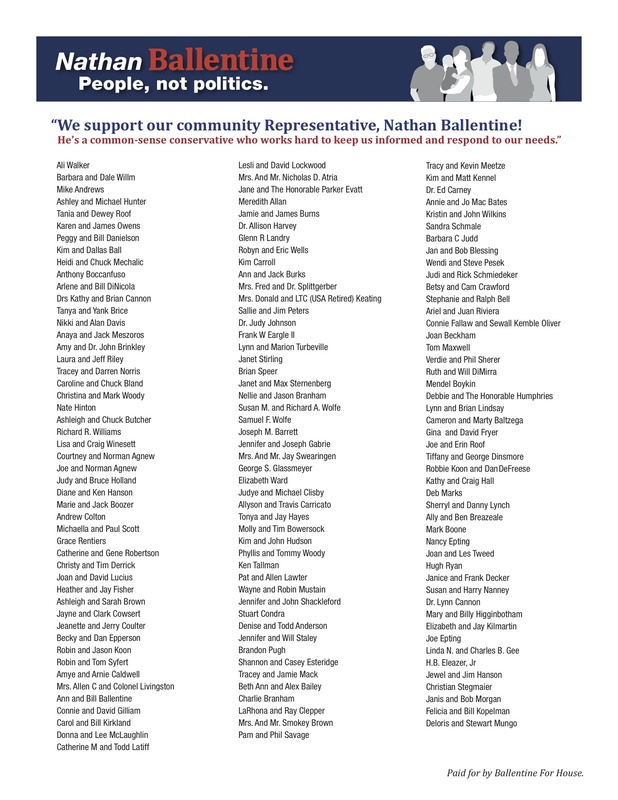 (Chapin, SC) – Today, businessman Nathan Ballentine announced his campaign for reelection to the State House of Representatives, District 71. Ballentine serves the people of Irmo, Chapin, and Dutch Fork. He has built a solid reputation as a civic leader committed to working well with others to get results that will help grow our economy and provide tax relief for South Carolina. Recent news stories have highlighted petty partisan politics and legislative infighting. This has left the perception that South Carolina government has become dysfunctional and ill prepared to partner with business groups to help grow our economy. Recognized as a “Friend of the Taxpayer” by the SC Association of Taxpayers, Ballentine is known for his fiscal conservatism and he has also received high marks from the conservation community. The South Carolina Chamber of Commerce and several other business and civic organizations have singled him out for his straightforward leadership in the legislature. Going forward Ballentine’s #1 focus will continue to be jobs and economic development. His campaign message remains People, Not Politics. For more information, please visit www.nathansnews.com where Nathan openly discusses issues of importance to House District 71 and the Palmetto State. Tuesday morning interview with local radio station 560 WVOC, click play. USC and Clemson will be required – by state law – to continue their annual football matchup in perpetuity if one lawmaker has his way. State Rep. Nathan Ballentine, R-Lexington, has introduced a proposal, to be considered by a panel of House members Wednesday, to require the two teams to continue their annual face-off, college football’s second-longest consecutively played rivalry in the nation. The teams have met 103 consecutive years. With both the Southeastern Conference, to which USC belongs, and the Atlantic Coast Conference, to which Clemson belongs, adding teams this year, Ballentine and some other fans are worried that scheduling conflicts could mean no more USC-Clemson matchups. South Carolina Gamecocks defensive tackle Kelcy Quarles celebrates a stop of the Clemson offense in the fourth quarter at Williams-Brice Stadium on Nov. 26, 2011. For instance, the ACC soon will add Pittsburgh and Syracuse universities to its membership. As the ACC expands, it also will require league members to play nine conference games each fall – up from the current eight. That will leave Clemson with only three games to play non-ACC members, including USC. The SEC also is expanding – adding Missouri and Texas A&M. Other longtime rivalries have been put on the shelf as conferences have realigned, Ballentine noted. Ballentine said he wrote both universities, asking for their input, but heard nothing. University officials said Monday that they do not want legislative guidance on their football schedules. Spokesman Wes Hickman said USC appreciates Ballentine’s sentiment but does not support his bill. “Athletic schedules need to be decided by athletic directors and coaches,” Hickman said. This wouldn’t be the first time Palmetto State lawmakers have stepped in to preserve the state’s most well-known rivalry game. During his research, Ballentine discovered that USC and Clemson only played each other Oct. 23, 1952, because the General Assembly intervened to require that they play. That year, Clemson ignored a ban on going to a bowl game by its then-conference – the Southern Conference – and played the University of Miami in the Orange Bowl. The penalty? 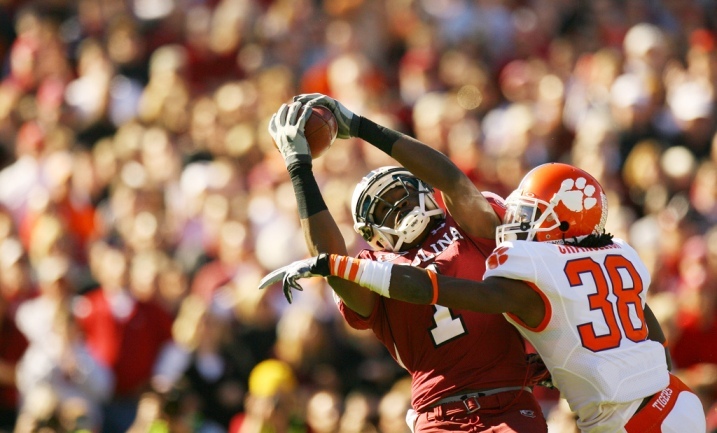 Clemson was barred from playing any other Southern Conference opponent, including USC. “There is a precedence for doing this,” Ballentine said. Many recall my support four years ago for a relatively unknown (in our state) Governor and businessman to represent my party in the November 2008 Presidential election. The dominant topics during that campaign cycle were the war on terror and our national defense. When it became clear that another candidate with more expertise in those areas would be the Republican nominee, Governor Romney graciously suspended his campaign in order for Senator John McCain to work towards his impending general election opponent. 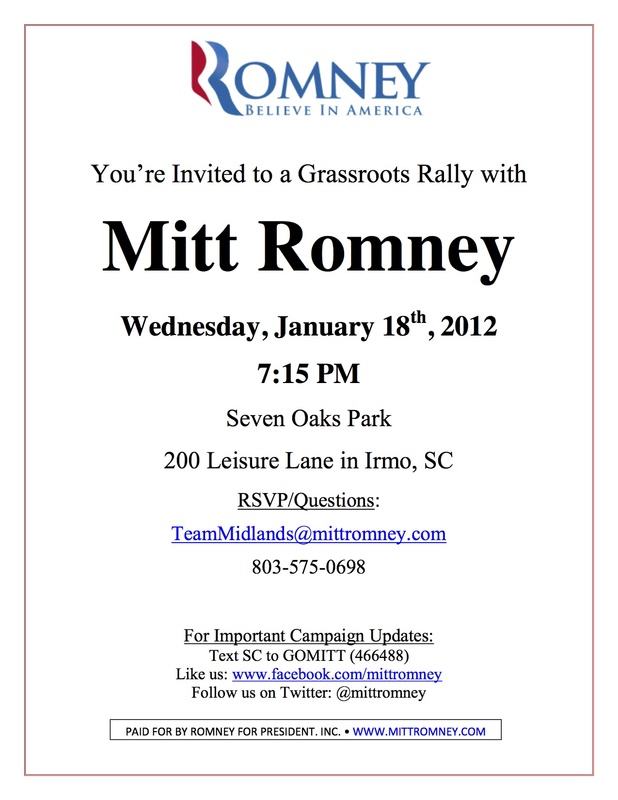 Earlier this year though, Governor Romney came to my home in Chapin and shared he was strongly considering another run. Karen and I immediately offered our support! Representative Huggins and I took him that day to meet with local business owners and neighbors who have been struggling in these economic times our country now faces. While I thought Governor Romney was best in 2008, he certainly is best now when our country needs someone (from outside Washington) to help turnaround this struggling economy! A turnaround much like he did when he turned deficits into surpluses as Governor of Massachussets, when he saved an Olympics mired in controversy, and as he did working in the free-market to ultimately expand business and grow companies and create jobs. I hope you’ll join me as he visits our community again tomorrow evening at 7:15 pm at Seven Oaks Park for a grassroots rally. Get there early and please let us know you’re coming by calling the office at 803-575-0698.